From E.Y., attending a private girls’ school in the Channel Islands (or possibly someone maliciously using her name), taking exception to Dr Sarfati’s review of Dr Richard Weikart’s book From Darwin to Hitler. She has a number of misconceptions about the way beliefs have consequences, church history and biblical exegesis. Dr Sarfati responds below, pointing out the real reason for the Crusades and the real nature of the anti-slavery abolitionists. It is most unwise for people today to cover up evolution-based atrocities, because then people will be less vigilant of possible repeats. [Update 2007: this year is the bicentennial of the abolition of slavery in the UK (see the later article Anti-slavery activist William Wilberforce: Christian hero), so we are visiting this feedback that touched on this issue. We also plan to write more on the issue, the biblical teaching, and the strong Christian background of the abolitionists. Similarly, many American Christians bitterly denounced slavery (see this collection of Christian anti-slavery articles from history). From Wikipedia. Released into the public domain. And there are other articles on the subject preceding these three issues, e.g. my editorial The Holocaust and evolution and the subsequent article Nazis planned to exterminate Christianity. … a link which I find nothing short of disgusting. It would be a lot more helpful if, instead of complaining about being offended, you answered the arguments. The Jewish commentator Dennis Prager put it very well in Blue America: The land of the easily offended. It would have been better to attempt to disprove Prof. Weikart’s extensive documentation of the Darwin–Hitler link. It should be properly interpreted as ancient ‘trash talk’ against an enemy who had done just that to Israelite babies—see Ancient Mores and Modern Moral Imposition and Outrageous Reasoning. Even today, in the Middle East, people utter curses such as, ‘May your children be orphaned and your wife widowed’, but in most cases that is the limit of the violence, and the enemies cool off after such vicious insults. Conversely, these middle easterners would be shocked at the readiness of many Anglo-Saxons in history to fight or even duel to the death. … would lead to the Crusades. Actually, many historians are recognizing that the Crusades were a justified response to centuries of Islamic aggression, e.g. Robert Spencer: The Politically Incorrect Guide to Islam (and the Crusades). We have often demonstrated that the occasional atrocities committed by professing Christians were completely contrary to the teachings of Christ, while the atrocities of 20th century Nazis and Communists were totally consistent with evolutionary teaching. Also, just think about the historic centres of Christianity such as Jerusalem, Antioch, Alexandria and the rest of north Africa—they are now Muslim lands, converted at the point of the sword. And after the crusades, the Muslim Turks conquered the ancient land of Asia Minor, the birthplace of the Apostle Paul, the site of many of his missionary journeys and home of the Seven Churches of the book of Revelation. Furthermore, when they conquered Constantinople (now Istanbul) in 1453, they turned Hagia Sophia (Holy Wisdom), the world’s biggest church of its day and centre of Eastern Orthodoxy, into a mosque. Note that a just war can still have atrocities without affecting the justness of the war itself. In the case of the Crusades, problems arose because many of the soldiers were biblically illiterate, and had justification-by-works mentality, thinking that they could earn salvation by going on the Crusade. However, biblical Christianity is not the cause but would have been a corrective if followed—salvation is by grace alone through faith alone, not by works, as shown by Paul’s citation of Genesis 15:6, ‘Abraham believed the LORD, and it was credited to him as righteousness’ (Romans 4:3, Galatians 3:6, cf. Eph. 2:8–9). Your case against Darwinism, particularly in Dr Sarfatis latest article, fails in two distinct ways. Firstly, although on the one hand Darwinism may encourage the strong to dominate the weak, and lead to active racism, on the other hand, since blind chance rather than divine justice is seen to be the force in charge, man must determine his own justice, and is obliged to live altruistically, expecting to be treated likewise. Obliged? How does this follow? This is the is-ought fallacy—one cannot derive what one ought to do from the way things are. And how is this really altruism, since under this reasoning one is serving others only to obtain some favour in return. Under this ‘moral law’, how could you judge the actions of a masochist as wrong (enjoying pain, the masochist injures others to be injured in return)? And if man determines his own justice, which man? Why not Hitler? After reading e-mails from your critics, both on and off your site, I have come to agree with your position that the pot is calling the kettle black. You are criticized for having a faith based position founded in the bible. But this criticism is made by people who themselves hold to a faith based belief in naturalistic evolution. You interpret the evidence based on your presuppositions, they interpret the evidence based on theirs. I read an article in Astronomy Magazine which stated the multiple universes are a fact of life because the latest equations allow for them. Now obviously there is not and CANNOT be ANY evidence to support this theory, but because its POSSIBLE its FACT. But the whole theory of evolution is one exercise after another in circular reasoning and the utter predominance of theory over fact. I used to be a supporter of Hugh Ross. Now I understand the uselessness of his approach. We cannot win over souls for Christ by subordinating the bible and our witness to antiChristian pagan ‘scientists’ by ‘evidence’. The heart must be prepared first by the Holy Spirit. Only then can their blind eyes be open. But by compromising, we quench the Holy Spirit who lives within us. I've read your website for years, on and off. I finally get it. ‘During Stalin’s forced collectivization of agriculture, the Commissar of Agriculture visited a peasant farmer and asked him about his crops. But that is exactly the case for morality if God is imaginary. The leading atheistic evolutionist Richard Dawkins agreed. And please try to understand that we are not claiming that atheists can’t be ‘moral’, but that they have no objective foundation for their morality, as I explained in Bomb-building vs. the biblical foundation. This is one of the points that Prof. Weikart made that I emphasized in my review—that Darwinism undermined the Judeo-Christian notion of sanctity of innocent life. Darwinism thus interpreted should lead to a fairer and more equal treatment of all human beings, since there is no distinction between the sinner and the righteous, and all wish to live. How can it, when Darwinism is based on the strong overpowering the weak, both within a species or between species (‘survival of the fittest’)? Even altruism is explained away as say ‘kin selection’. Secondly, it is simple to turn every point made against Darwinism into a point against Christianity. For example, once society starts down this path of regarding any class of humans as not worthy of life, it is hard to stop extending this A number of humans will be eternally damned, if God has elected only a chosen race to be saved. There is no such passage in the Bible. God chose the Jews so that all nations would be blessed (Genesis 18:18). There is no salvation based on race, because everyone becomes a son of God the same way, through faith in Christ, whether Jew or Greek, male or female, slave or free (Galatians 3:26–28). The undiscerning Christian could claim that any current non-believer is and always will be spiritually dead; their only use on earth is thus as a tool of the devil, and they might as well be physically removed. They would have to be undiscerning indeed, since Jesus’ Great Commission (Matthew 28:19–20) makes it clear that we are to preach the Gospel to non-believers. There is no hint of forced conversions, which would not be genuine anyway. Christians are even commanded to love their enemies, so I don’t know where you got this idea from. Or, Dr Sarfati claims, the German Darwinian racists dismissed the darker races as being closer to the apes than to the superior lighter humans, leading to the Herero atrocity. Not just my claim, but well documented in the book cited. How can one even talk about ‘Christian reasoning’ in this case? At least with the imprecatory Psalm cited above, there was a biblical passage involved, albeit understood totally contrary to the original meaning. But this can’t even be justified as biblical reasoning when it invokes something not mentioned in the Bible at all? As we have pointed out, the curse wasn’t even on Ham at all, but on his son Canaan, and by implication, only Canaan’s descendants. There is not the slightest hint in Scripture, whether explicitly or by logical deduction, that they were black, let alone that blackness is the result of any curse. and it was this that often justified the horrific and centuries-long slave trade, rather than any secular theory. This is simply not true. I have already explained this in detail in The Bible vs slavery and apartheid. But more recent information further strengthens the case. As conservative black economist Thomas Sowell points out in the Slavery chapter in Black Rednecks and White Liberals, slavery for most of its history was not a racial issue. Europeans enslaved Europeans (the word ‘slave’ comes from ‘Slav’), Asians enslaved Asians, and Africans enslaved Africans—black slaves were usually first captured by other blacks because the Europeans were susceptible to African diseases if they ventured into the Interior. Most slaves did not differ racially from their masters. However, as Carroll and Shiflett point out in Christianity on Trial, this was a deduction from Paul’s statement in Galatians 3:38 (above), but would have been laughed at in pagan times. It was this declaration that led Lincoln to abolish slavery, citing it in the Gettysburg Address. However, American slavers likewise realized the contradiction between slavery and the Declaration, so some of them invented schemes by which the black slaves were regarded as less than human (this explains the origin of such contortions of alleged scriptural teachings as you mention above). This culminated in the infamous 1857 ‘Dred Scott decision’ by the US Supreme Court, under Roger Brooke Taney (1777–1864), where slaves were defined as non-persons. This sounds similar to today’s activist Supreme Court that has defined unborn babies as non-persons. To further show how simplistic the ‘racism led to slavery’ charge is, Sowell chose the title ‘Black Rednecks’ for a good reason. He shows that what liberals call ‘authentic black culture’ is actually a relic of a highly disfunctional white southern redneck culture. This in turn came from the ‘Cracker culture’ from the regions in Britain, mainly on the harsh English border, they immigrated from. All the characteristics can be traced, e.g. To shore up his point, Sowell documents that there was a far bigger divide between the cracker/redneck culture and the North than between white and black. E.g. Northern blacks tried to stop redneck blacks coming up from the South, and the same happened with northern whites with redneck whites. Your articles show only that wicked men will use any means possible to perform their barbaric deeds. Rather, they show that Darwinism aggravated their evil by providing a pseudo-scientific justification, and undermining the only philosophy that could consistently oppose it (the Judeo-Christian/biblical framework). Evolution may have been Hitlers route to the minds of the population but Christianity sent men to the Crusades and religion is the buzzword of both sides in the Iraq war today. Actually, Saddam’s Baath Party was secular and socialist. CMI is apolitical so cannot comment about an ongoing event such as the ousting of Saddam from Iraq. 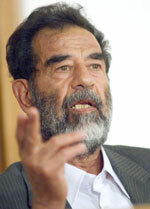 However, the military action against Saddam can hardly be fairly construed as anti-Islamic, as the Islamicists have much more freedom now to practice their religion than they did under Saddam (who in 2006 was tried and executed for mass murder). Nor did any of the official justifications for the war mention religion. The only true link between Darwinism and the Holocaust is their contemporaneity. Your general demonisation of evolution is utterly unfounded and unfair. Rather, it is most unwise for people today to cover up evolution-based atrocities, because then people will be less vigilant of possible repeats. I pointed out in my review that atheistic evolutionists such as Peter Singer advocate eugenics/euthanasia policies almost identical to those of the Nazis. The ironic thing is that his own grandparents suffered under the very philosophy and consequent policies that he advocates, and he also had no answer (or rather, didn’t want an answer) to the problem of death and suffering.